Fears of loss of public open space were confirmed today when the State Government finally produced some drawings to give the public some idea of the size and shape of the Gold Coast Marine Development Project. 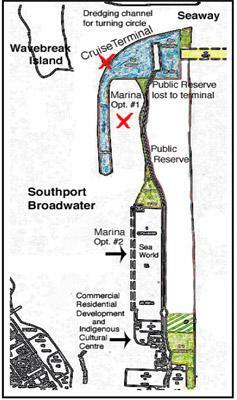 Steve Gration, President of the Save Our Spit Alliance (SOSA) said " The drawings demonstrate that not only will the public lose open space for the terminal, it will also lose the use of the Marine Stadium and foreshores and a portion of the Seaway to the wharf and these are not the final drawings. It is a bad notion." The notional drawings do not show the location of the infrastructure described in the environmental impact study terms of reference. These include parking for 400 vehicles including 40 buses, energy supplies including electricity, solid and liquid fuels, on site treatment and emergency storage of waste-water and storage of hazardous chemicals. Lois Levy, Gecko representative on SOSA said, "People should not be fooled by pretty pictures. These notional drawings do not show the damage to the marine life from the massive dredging required to allow these huge ships to enter and exit the Seaway, nor the poisoning of the waters from anti fouling chemicals on the bottom of the ships." The Gold Coast Marine Development Project states that there are two options for the 345 berth yacht and superyacht marina, but the second site west of Seaworld is not on display and was not part of the brief for the consultants Gutteridge Haskins Davey. Methven Sparkes, President of Nerang Community Association said " The failure to include this second site for the marina raises our concerns that a second site was just a token gesture, while the real intention is to take away the public's open space of the Marine Stadium for a select few who can afford luxury yachts." "We are also appalled at the low level of community consultation being undertaken. It consists of two or three superficial displays of pretty pictures and one-on-one question and answers with consultant representatives, most of whom were very poorly briefed. I was told there would be no public forum, because these highly paid consultants felt unable to manage members of the public who might dominate the questioning. This is totally unacceptable." Said Lois Levy of Gecko. "Our rapidly growing City needs every square metre of public open space for the physical and mental health of its residents. Both State and Local Government have failed the population in provision of adequate public open space and now the State Government wants to take the remnants away from us." Said Rita Mahon, Secretary of Gecko, Gold Coast and Hinterland Environment Council. Steve Gration, President of Save Our Spit Alliance. Lois Levy, Gecko campaigner 0412 724 222. Save Our Spit Alliance, 139 Duringan St Currumbin 4223.